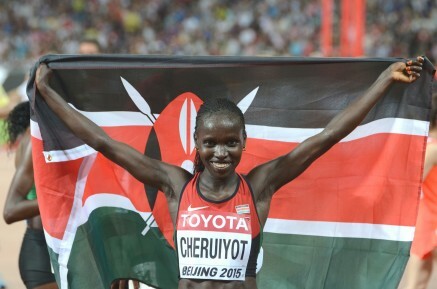 24th August 2015 – At the 2013 World Track and Field Championships Vivian Cheruiyot (KEN) was not able to defend her 5000m and 10,000m titles having taken some time away from the sport due to the birth of her first child, son Allan. Since then she has diligently worked her way back to fitness until she once again had the opportunity to challenge for a world title. Tonight in Beijing that chance came and she completed her journey full circle as once again she is celebrating being the World 10,000m champion. In a race that saw almost metronomic lapping early on Vivian sat off the pace just ticking the laps off with effortless efficiency. As the main protagonists moved to the front with 3km remaining Vivian still sat back letting others do the work. Indeed it was not until the final 400m that Vivian showed her hand for the first time moving into second as Ethiopian rival Gelete Burka hit the front. Vivian made a strong move with 300m remaining and as she passed 200 to go led the race for the first time. However, she still had Burka for company as the two entered the home straight and it took one more final push for Vivian to get the gap she needed and be able to celebrate as she crossed the line in 31:41.31. Beginning the defence of the title that she did win in Moscow, Christine Ohuruogu (GBR) won her heat of the 400m in 51.01 seconds to automatically qualify for the semi-finals.